A tropical cyclone has hit South East Africa, leaving thousands of families displaced with no safe accommodation, clean water or medical supplies. 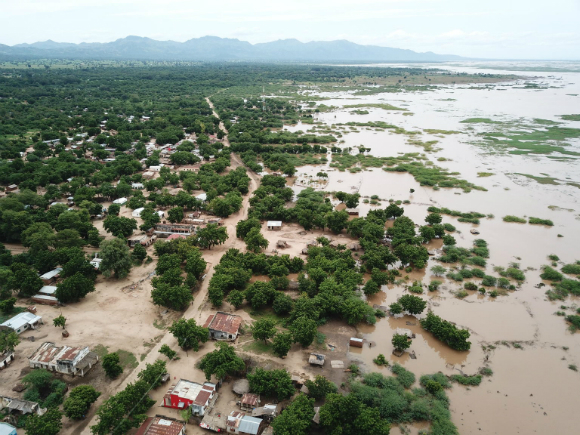 Severe flooding has caused widespread damage to infrastructure and decimated homes and businesses throughout Mozambique, Malawi and Zimbabwe. Families who have lost everything are now fighting to survive in makeshift shelters without adequate food or clean water supplies. Right now children are under threat from rising flood waters and dangerous waterborne diseases. Please help us provide humanitarian aid to those affected by Cyclone Idai by donating today. The region faced weeks of heavy rain in early 2019, which left the ground waterlogged and unable to absorb any further rainfall. The land and surrounding rivers were already at breaking point when Cyclone Idai hit the eastern coast. The deluge of rain, combined with hurricane-force winds, caused severe flooding across the region, which damaged its infrastructure and clean water supply. As flood waters continue to rise, so do the number of people affected. Early estimates suggest that as many as 460,000 children are without food, shelter and clean drinking water. The death toll is currently 56, but this number is also expected to rise. In Mozambique, the port city of Beira was the worst hit and has suffered widespread damage, making it almost inaccessible to aid workers. The city’s main road network is completely destroyed making it difficult for anyone to get in or out. Throughout the city, families and children are desperately fighting for survival. Many are making their way to rooftops and higher ground for shelter. Many buildings, including the city’s Beira Hospital, are damaged. The destruction has seriously hampered medical care, with its emergency and surgical departments closed. In Malawi, thousands of families have been forced from their homes with what little they could carry. Supplies of food and clean water are low, with many families lacking even basic supplies. In Zimbabwe, major roads have been devastated making it difficult to access the worst affected areas. Mudslides, floods and torrential rain are hampering efforts to provide support and it seems, the most affected region, Chimanimani, has been cut off by the storm. Across the three countries, water levels are rising, putting children in ever-increasing risk. With dirty flood water contaminating water sources, children, especially those under the age of five, face the deadly threat of cholera, diarrhoea and other water-borne diseases. UNICEF teams are on the ground working to keep children warm and dry while providing essential supplies and medical care. But the scale of the emergency is huge and getting worse by the hour. With the threat of strong winds, heavy rains and flooding, we know children and their families need safe drinking water, health supplies and emergency shelter. Please donate now to help provide life-saving assistance to children affected by this disaster.